The rich flavors that can be created from combining spices and simmering them together for a period of time can be divine. 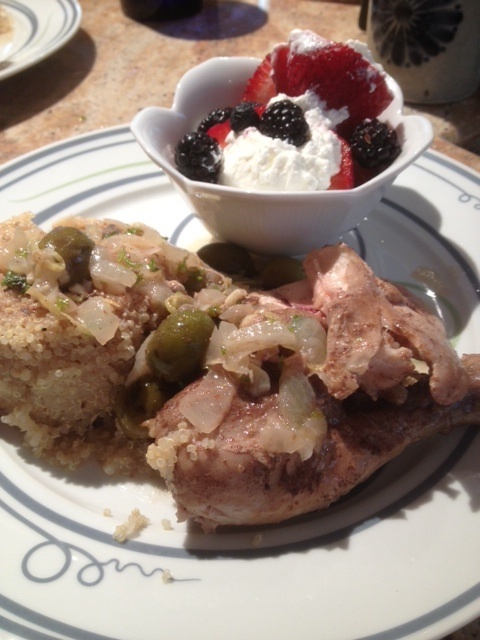 We recently tried out a Chicken Tagine (345/cal) as part of our Mediterranean Diet journey. The chicken was simmered in a Dutch oven with garlic, cinnamon, ginger, along with chicken broth, onion and olives . Lemon rind, lemon juice, cilantro and parsley are added later. It was indeed tasty. It is not the most visually appealing dish, though. I think next time I prepare it I will add a slice of lemon and parsley to sprinkle on top before serving to make it more colorful. To make it a meal I added 1/2 cup of quinoa (111 cal), a cup of mixed berries (52/cal) with a dollop of nonfat Greek yogurt (2 Tbsp/35 cal) for a total calorie count of 543 calories for the meal. This was a Friday night meal for us. To make it closer to 500 calories just leave off the Greek yogurt. For those who love olives this is an ideal meal. It will be a repeat for us.